John has a long career as a social activist. In 1978 after working on the sucessful No on 6 Campaign he served as Co-Chair of the San Diego Gay Pride Parade. His editorial cartoons have appeared in the San Diego City College FortKnightly newspaper. He served as President of the San Diego Veterans Association and Coordinator of the San Diego Veterans Day Parade. He has worked as a Benefits Counselor at the San Diego LGBT Center for Social Services. He has also served a Vice-Chair and Quality Assurance Chair of the HIV Consumer Council. In 2002, John received a Special Commendation from City Councilmember Toni Atkins for being named Volunteer of the Year by the Consumer Council. He has been a member of the staff of the Strength for the Journey retreat for over 15 years and served as their Dean for three years. John's home in North Park, San Diego, has been the site of several major fund raisers for local AIDS organizations. John is currently Co-Convener of the Unitarian Universalist Men’s Fellowship and a volunteer at Being Alive San Diego. 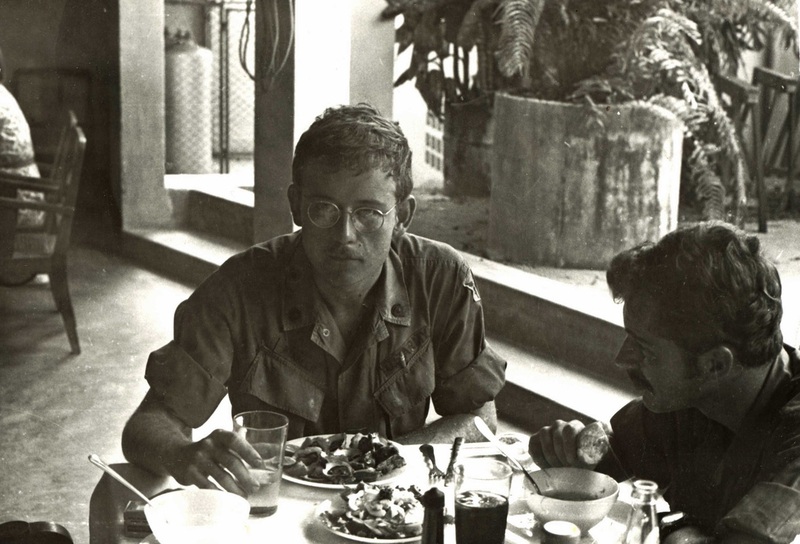 John in the U.S. Army in Nha Trang, Viet Nam. John is a creative artist working in many media. Born in Texas, the son of a carpenter father and seamstress mother, he is self taught. John's grandfather was one of the last blacksmiths in West Texas. Influenced by the beauty of Southern California, John began painting in the mid 1970s . He began working in wood in the early 1990s. He has shown in several local galleries, curated exhibitions and facilitated art therapy sessions. 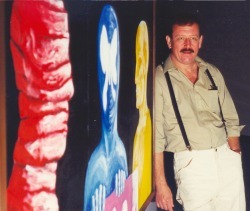 He served as an instructor and exhibition coordinator for AIDS Art Alive, an art therapy class for persons with HIV and other life-threatening conditions. For fifteen years he has been the creative artist for the Dr. A. Brad Truax Awards. Three times he has curated the Kids Art Therapy (KAT) exhibition for the UCSD’s Mother, Child and Adolescent Program. He is the founder of the Positive Artists Portfolio Archive (PAPA). He annually contributes to the Visual AIDS Postcards from the Edge benefit show at the in New York City. His work was featured in the November 2006 edition of POZ Magazine. John currently coordinates Art of Pride, the art exhibition and competition of the San Diego LGBT Pride events. He also serves on the Steering Committee of the Bard Hall Art Guild as well as a Member of the Board of Trustees of the First Unitarian Universalist Church of San Diego.